Robotic Dispensing Automation Solutions - Flexible Automation Inc. 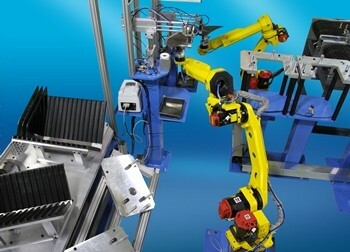 When it comes to robotic dispensing solutions, look no further than Flexible Automation. With over 35 years building robotic systems, we have extensive knowledge in a wide array of industries. We have worked with a wide range of machines serving a variety of application types and dispensing materials. Our systems have been designed to allow for semi-custom solutions while ensuring the integrity of the entire system. This gives the ability to adapt it to fit your needs from size to brand and everything in between. Robotic application of primer yields uniform coverage and optimum adhesion. Clear and black primers can easily be applied on windshields and roof modules. Increase bonding strength by surface modification of substrates prior to dispensing media. Many adhesives, primers and encapsulating compounds require a curing process prior to handling. 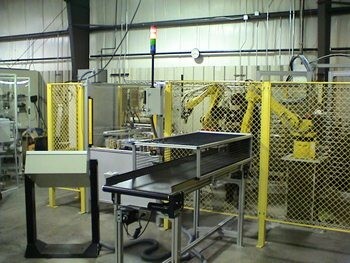 Flexible Automation, Inc. is experienced at integrating numerous curing technologies. Encapsulating material and thermal pastes can be applied quickly and efficiently using robots. Robots can provide fast and accurate application of grease and oil in hard to reach orifices. Joining two surfaces and seam sealing can be automated by using a robot to apply a linear bead, dots, or spray adhesive on a wide variety of substrates. Form In Place Gaskets are a great for products with complex geometry that make application of traditional gaskets difficult. FIPG also reduce labor costs and increase quality. Supplying adhesives, lubricants, and gasket compounds to metering valves can be automated for both low and high viscosity materials.